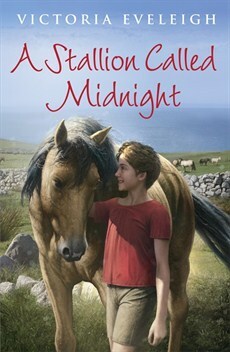 Jenny secretly befriends Midnight, a wild stallion, on the island on Lundy, but then must leave him behind. The island of Lundy is twelve-year-old Jenny's world, with its close-knit community of islanders and lighthouse-keepers. But when Jenny goes to boarding school on the mainland, she must leave behind everything she loves - including Midnight, the wild stallion she has secretly befriended. I've loved Victoria's previous pony books and thoroughly enjoyed this one. It was really interesting learning about island life, from the day to day life of caring for ponies to the harder parts of life like having to leave the island to attend school. Jenny's heart was stretched and broken to it's limit. I felt so sorry for her. Sometimes I saw where the plot was going and I just wanted to be able to tell her to let go, that things will work out. And they truly did - just as they normally do in life, only never quite how we expect them to. This gains 9/10 read because in a few places the phrasing took me out of the story - nothing specific, but enough that the magic of the read was broken. Make sure you check out Victoria's website. You have to read Victoria's other books, including a pony trilogy which includes Katie's Wild Foal.